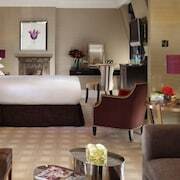 A stay at Bulgari Hotel, London places you in the heart of London, minutes from Harrods and close to Royal Albert Hall. 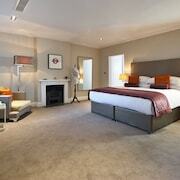 This 5-star hotel is close to Buckingham Palace and Big Ben. 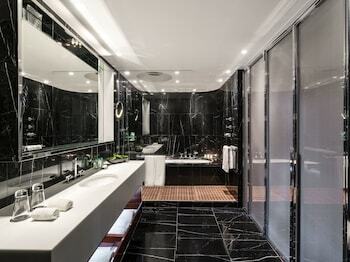 Make yourself at home in one of the 85 air-conditioned rooms featuring minibars and espresso makers. Your bed comes with down comforters and Frette Italian sheets. Wired and wireless Internet access is complimentary, while 42-inch flat-screen televisions with digital programming provide entertainment. Private bathrooms with separate bathtubs and showers feature deep soaking bathtubs and rainfall showerheads. Featured amenities include a business center, limo/town car service, and complimentary newspapers in the lobby. Planning an event in London? This hotel has 4951 square feet (460 square meters) of space consisting of a conference center and meeting rooms. A roundtrip airport shuttle and a train station pick-up service are provided for an additional charge.